Max Peiffer Watenphuhl studies medicine at first, then law and finally does a doctorate as a lawyer about canon law in 1918. In Munich he gets to know Paul Klee and leaves one year later for the Bauhaus in Weimar where he comes together with Gropius, Itten, Feininger and Kandinsky. In 1924 Watenphul comes to Salzburg for the first time and works on the field of enamel painting at the studio of Maria Cyrenius. He feels so enthusiastic about the city that he keeps coming back until the middle of the sixties. Appointed to teach at the Folkwang-Schule in Essen he works there from 1927 - 1931. That year he receives the award of Rome and following this he spends a few months at the Deutsche Akademie Villa Massimo in Italy. In 1933 he decides to move to Italy completely where he meets German painters like Gilles, Levy and Purrmann on Ischia. Eight years later he returns to Krefeld where he works at the textile technical college. He continues this kind of teaching at the Kunstgewerbeschule in Salzburg from 1943 on. After his flight to Venice in 1946 he stays in this city until 1957 where a number of his well-known city pictures are created. Venice is for Watenphul a \'black\', dying city and so dark façades, which express the degenerated atmosphere of a sinking beauty, dominate his pictures. 1956 Watenphul moves to Rome. 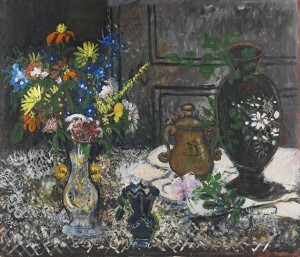 His connection to Salzburg still remains, the city finally puts a studio at his disposal and Watenphul becomes successor of Kokoschka at the Sommerakademie. From 1946 on the painter spends three months each year on the Greek island Corfu. His colour lithographies for Goethe\'s \'Buch Suleika\' (Edition de Beauclair) are created in 1965/66, the colour lithography for Venice and the Greece-folder (Edition Beauclair) in 1967. Peiffer Watenphul receives the following awards (just to name a few): Preis der Berliner Akademie der Künste (1932), Carnegie-Institute Award, Pittsburgh (1933). In 1965 he becomes member of the Bayerische Akademie der Wissenschaften und Künste.